Hang tight with me on this recipe. This is one of those recipes that I push flavors just slightly and it won’t be for everyone. I love tomatillos. They have a punchy, tart flavor that I’ve tried to balance with the sweet, warm flavor of pecans. I really love making nut and seed creams for soups. It’s an easy way to add a layer of flavor, bulk up the nutrition, and keep a recipe vegan. I turn to almond and cashew for mellow flavors but when I need something with a stronger presence, I use pecans. I will say, however, the overall flavor of this tomatillo soup is still tart. Roasting helps pull some of that tartness but it’s still there. I found myself occasionally adding just a hint of sweetener. Of course, this is completely optional! A light and refreshing summer tomatillo soup made with roasted tomatillos, onions, peppers, and a homemade pecan cream. Place raw pecans in a bowl and cover with filtered water. Let soak for 30 minutes. Drain and place in a blender with ½ cup water. Puree and continue to add water until the pecans are smooth and have a cream consistency. Set aside. Preheat oven to 425˚F. Remove the husk from the tomatillos (see note) and slice in half. Chop the onion and chili pepper. Place the tomatillos in a roasting pan along with the onion, chili pepper, and garlic. Toss with olive oil and a sprinkle of salt. Roast until everything is tender and the tomatillos are starting to brown, 20 to 25 minutes. Place the roasted tomatillos in a blender along with ½ cup of the pecan cream, cilantro, and lime juice. Puree until smooth, adding a bit more pecan cream until it reaches soup consistency. Taste and add salt or a bit of sweetener if desired (the tomatillos can be tart.) Place soup in a pot and heat until just warm. 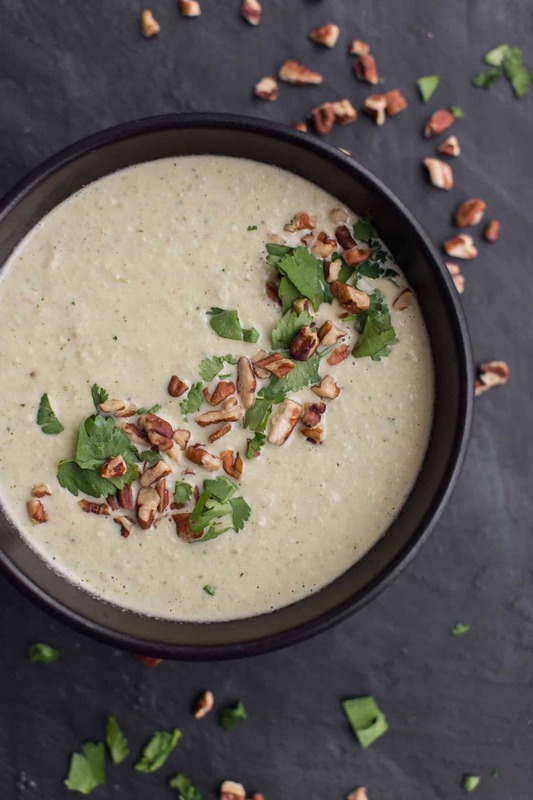 Divide the soup into two bowls and serve with a drizzle of pecan cream and extra cilantro. 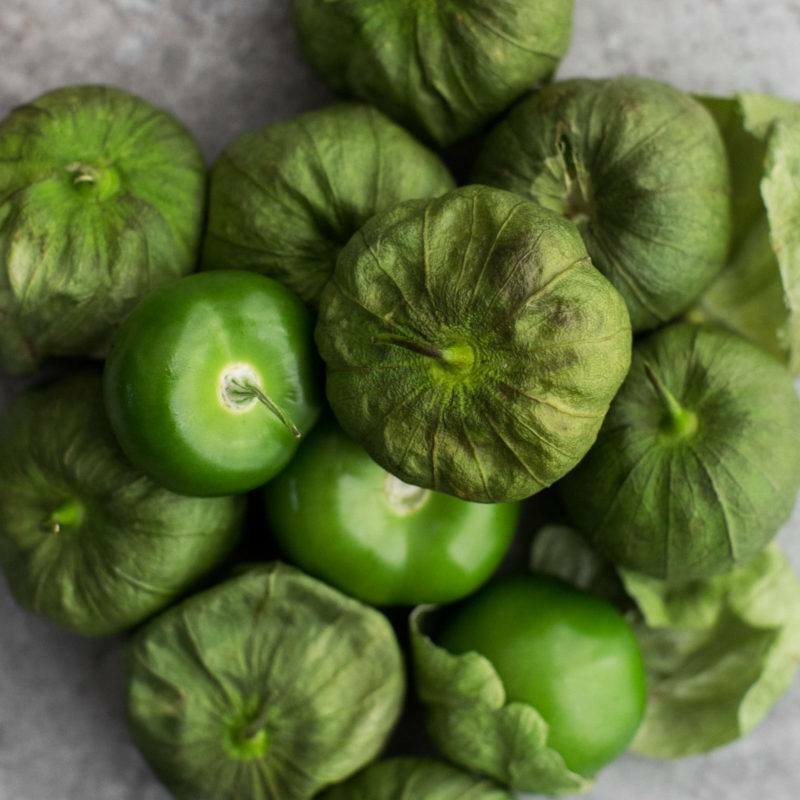 Tips & Tricks: I’ve found tomatillos that are have husks easy to remove and not so easy. If the husks don’t slip right off, place the tomatillos is a pot of boiling water for 60 seconds or so. Drain and remove the husks once cool. If you start with this soup and swap just a few things, you could end up with something completely different in an exciting way. The nut cream and roasted vegetable combination is fairly limitless. Play around with different combinations and don’t shy away from a heavy hand of herbs. 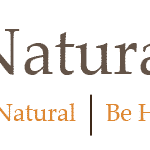 Almonds/Cashews: I don’t always have pecans on hand since they are a bit more expensive. Luckily, almond or cashew cream would work well. Herbs: I left the cilantro on the small amount. Feel free to add more. I’ve also had success with adding a bit of parsley. Tomatoes: I can’t always find tomatillos but the base of this soup works well with tomatoes. I’ve changed it before where I use roma tomatoes, pecan cream, and basil in place of the cilantro. I don’t ever feel like I use tomatillos enough. Their tart flavor is a nice contrast to the other summer flavors. Of course, I love making salsa and enchilada sauce with fresh tomatillos but this fruit is also great raw. What an interesting recipe! Thanks for sharing! I’m sitting here trying to imagine what pecan + tomatillo would taste like and I honestly have no idea – this combo seems very unique. I’m really looking forward to giving it a try once the tomatillos come in here. First of all, that’s one of the prettiest soup pics I’ve ever seen. Ow I’m off to the store to get what’s needed to try this interesting flavor combo. I’ve never had anything like this before, it looks so good! I love that it’s light and refreshing, totally perfect for the summer weather! I appreciate the recipe so much!